If you're an indoor gardener you probably have a spider plant, and if you have one spider plant, you probably have others - many others. Not only is Chlorophytum comosum one of the easiest houseplants to grow, this South African native also is a prolific producer. As the potted plant matures and root space decreases, spider plants compensate by producing babies. The offspring - known as plantlets - develop at the end of slender long stalks. All it takes is a pair of scissors and flowerpots filled with potting soil to create an explosion of young, verdant plants to give away to friends or disperse around your house. But why restrict this grass-like perennial to ceramic containers and hanging baskets? Spider plants adapt to exterior landscapes with effortless ease. Shady spot, sunny spot, dry soil or damp - Chlorophytum comosum can handle them all. An amazing ground cover - it even flowers. At the end of the long arching stems, small white blooms present a pleasant contrast with the green or variegated white/ green foliage. If you're looking for an "ignoreme- and-I'll-still-thrive" plant to surround a tree or fill a flower bed, spider plants are one way to go. I saw my first outdoor display of this common houseplant 22 years ago when I lived in Kissimmee. One day while biking by a neighbor's house I realized the plants forming a tidy mass alongside the house's main entry were the same type of greenery that once graced my college dorm room. "Are those spider plants?" I asked incredulously. Her affirmative reply got me thinking. A couple decades later, I find my own home edged by the same plants I once admired. Of the 200-some species in the genus Chlorophytum, only a few are commonly cultivated by home gardeners. In my yard, a wild variety with solid green leaves competes for space with the more familiar green and white spider known as "variegatum." In the landscape, spider plants require even less attention than their houseplant counterparts. I believe all plants deserve the best start possible, so mine began their outdoor life in soil enriched by compost and peat applications. 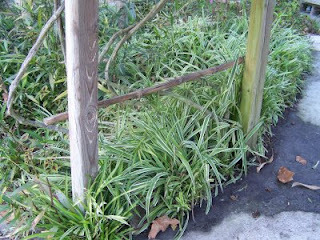 Although an irrigation system is in place, not all the spider plants are covered by the sprinklers. But lack of water is not enough to deter the life force in these hardy evergreens. Those not getting regular soakings still reproduce, sending multiple plantlets out into the world to set down their own roots and continue the cycle. The most frequent maintenance my outside spider plants require is a periodic pruning with a sharp pair of snippers. That used to be a task I didn't enjoy. Not because it was difficult, but because it made me feel bad. Each time I pruned, dozens of young plants were whacked to pieces. I felt like a killer with a carbon steel blade. I wanted to save them all; to root up the plantlets and find each a new home. But how many spider plants can one use? Inside or outside, eventually you reach a point where enough is enough. I reached that point a few months back. Despite being severed from their botanical umbilical cords, the plants, I realized, still fulfilled a useful purpose. They wouldn't grow up to become more ground covers, but they would decompose in the compost pile and turn into rich soil. Last week it was time once again to take out the hedge clippers. My walkway had all but disappeared beneath a web of spidery plants. With aggressive strokes, I hacked back the prolific growth infringing on the pathways. I'm pleased to report that the end result was surprisingly satisfying. If you're looking for a low-work houseplant that doubles as a ground cover, Chlorophytum comosum is the way to go. In a world already crowded with people and buildings, adding a bit more greenery to house or yard - even greenery that has to be hacked back occasionally - is a worthwhile thing to do.